Peter Matheson lives in a tiny house on wheels in Grand Forks, British Columbia. It’s an incredibly small home – only 120 square feet – but has all the essentials for living full time. While volunteering at a cold weather shelter in Grand Forks, he was asked to help design spaces for the homeless. He had never lived in a tiny house on wheels, so to inform the design he built the house as a prototype so he could experience living tiny. He was hooked. Peter is now collaborating with the city of Grand Forks on a tiny house community, which if successful may be the first of its kind in Canada. Now imagine a debt free tiny retirement like this for yourself, where you can spend your time as you see fit. 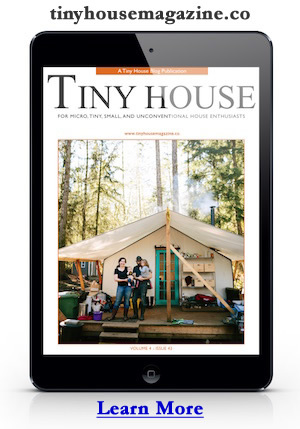 To help imagine what a 120 square foot house looks like check out our new book, 101 Tiny House Designs. Read more about Peter’s home at TinyHouseTalk.com. For more great videos like this be sure to follow Bryce Langston’s Living Big In A Tiny House Channel on YouTube. This entry was posted in Tiny Living and tagged british columbia, Bryce Langston, debt-free, Grand Forks, Peter Matheson, Tiny House Community, tiny retirement.